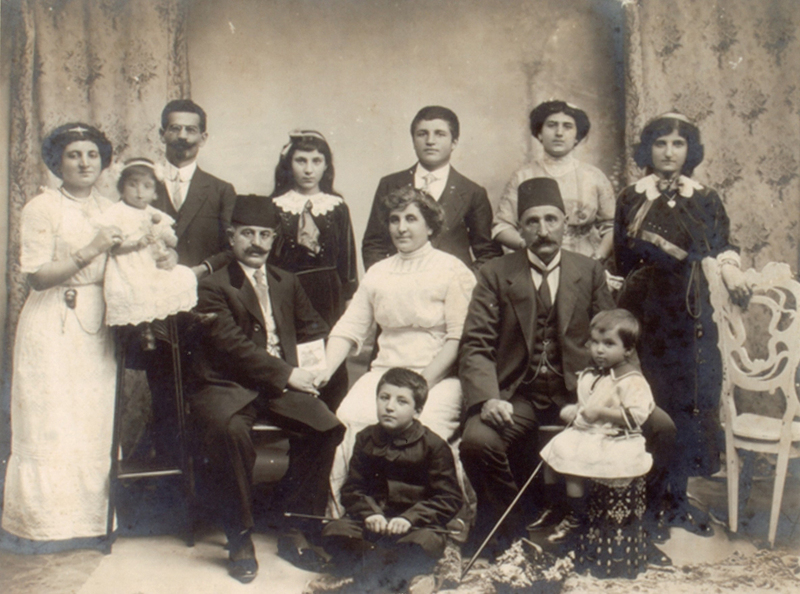 Only snippets of the multifaceted rich heritage of Armenians living in the Ottoman Empire have reached us. In this context, when the question raised refers with reconstructing this past and our collective memory, we sadly have to deal with traces and relics. No wonder that we are overjoyed every time we have a chance to make that past a bit more accessible, to shed new light on it, to reveal the unseen, to bring closer that which was beyond our reach, to explain the unfamiliar; in a word, to hitch the plow and open new furrows to understand Ottoman history and daily life, and to study this expansive and uncultivated field. 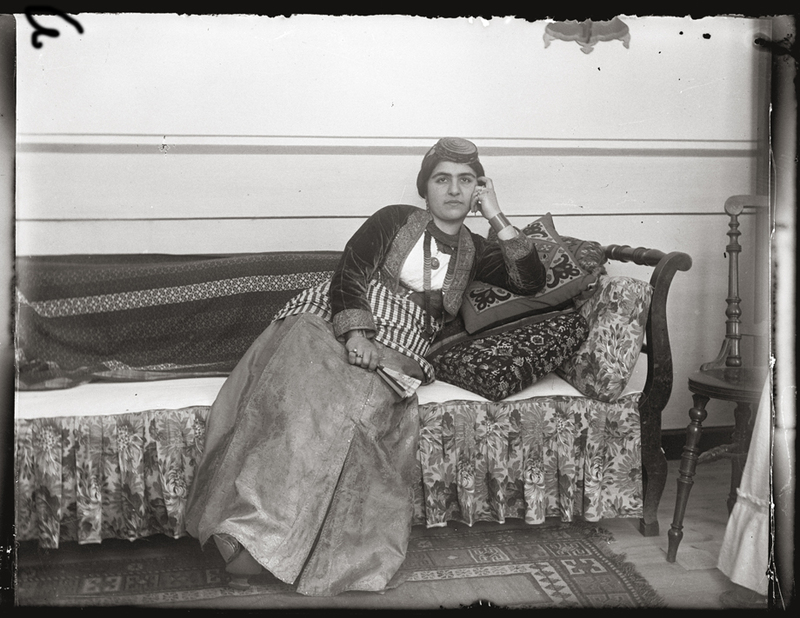 The discovery of a collection of over 100 glass photographs belonging to Arapgir born George/Kevork Djerdjian (formerly Djigerdjian) is one such opportunity. 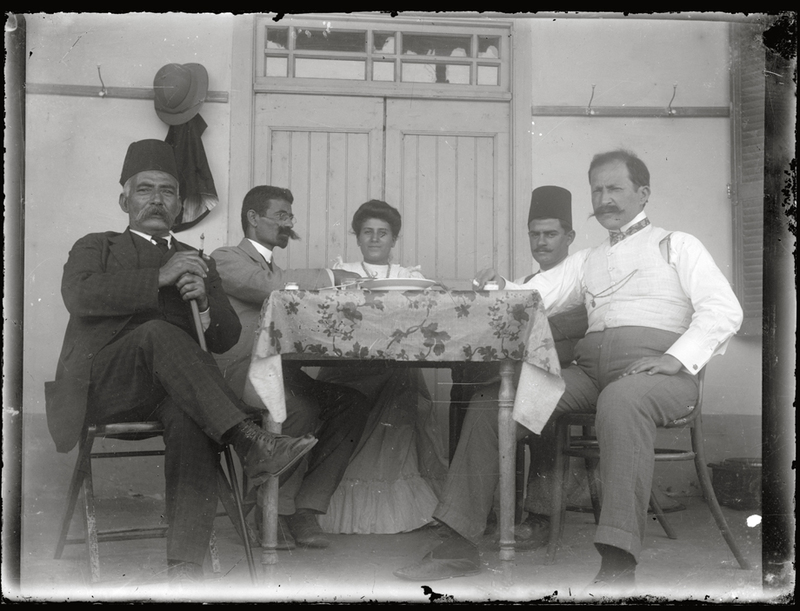 They are magnificent historical photos and serve as a new window on life in Arapgir, as well as Erzeroum/Garin, during the Ottoman era. 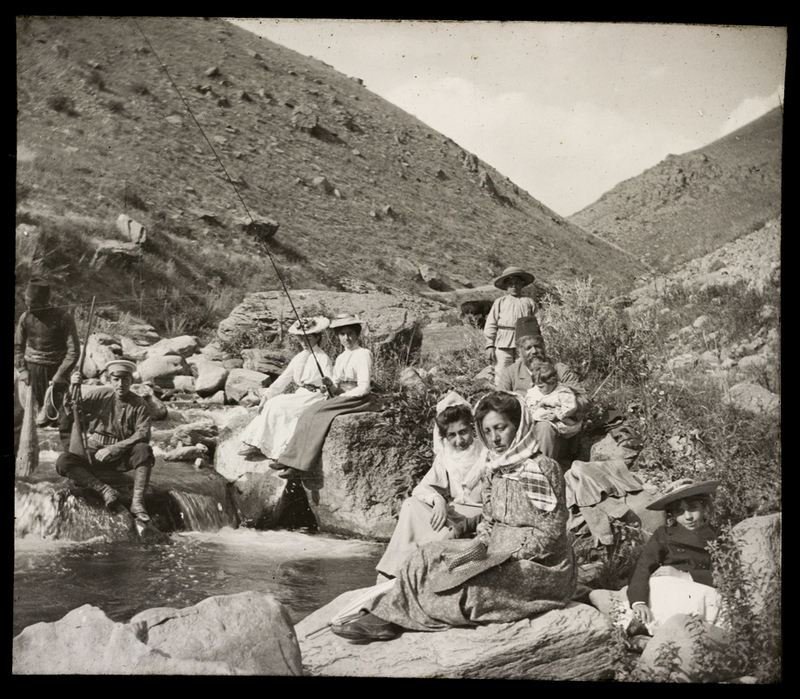 Through these photos, Armenian life of these places is revived – churches and schools that formerly had no image are now visible, and before us are placed heretofore unfamiliar pictures of family, school and orphanage life. Our sincere thanks to George Jerjian who placed high quality copies of his grandfather’s photo collection at the disposal of Houshamadyan. Arapgir: St. Asdvadzadzin Church (center). Built in 1830s. Changes to the roof first made in 1893. This photo was probably taken after the first construction work was over. It was an expansive church that had three galleries for female worshipers. The church had three entries; two facing west and one, north. The roof was completely renovated post 1907. 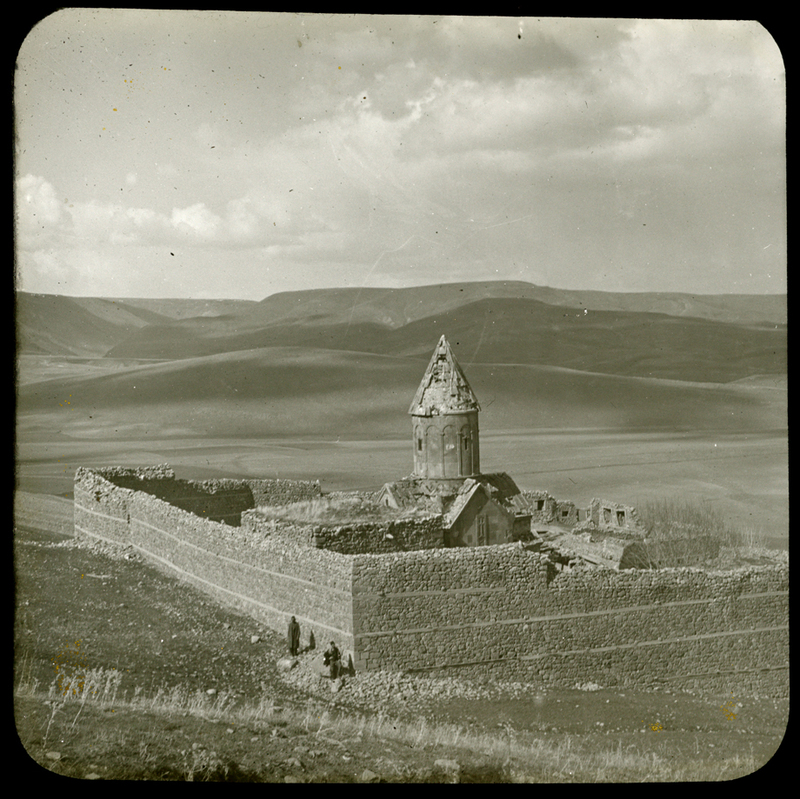 The Djerdjian photo is pre-1907 and shows the roof in its prior state. 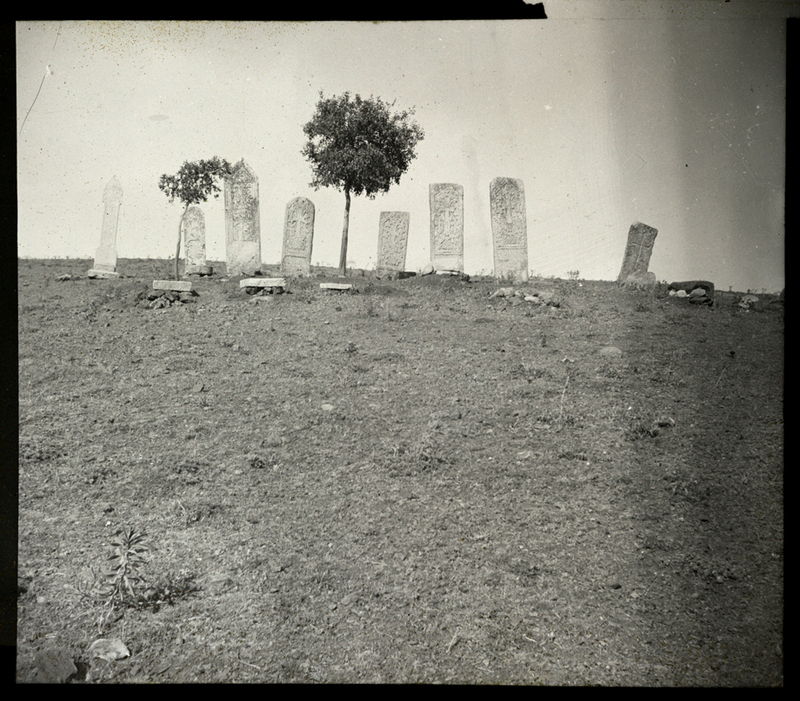 For comparative and historical purposes, we present below two other photos (they aren’t a part of the Djerdjian collection), that were taken after 1907. Arapgir: Panorama. 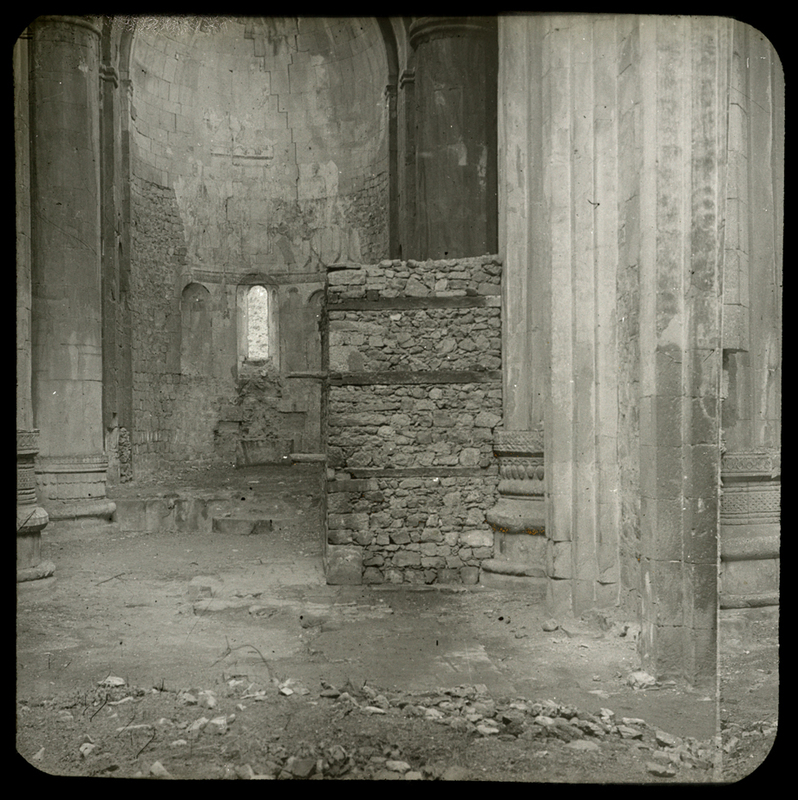 We assume that the large edifice on the left (in the two photos above) is a part of St. Asdvadzadzin Church. Construction scaffolding can be seen on the church’s roof. Arapgir: St. Asdvadzadzin Church. This is a double exposure. The interior of the church appears on one side, with its many columns and altar, while the roof of the structure and nearby houses appears on the other. Arapgir: Hanesian Girls’ School. Built in 1890 with financing from Tateos Efendi Hanesian. 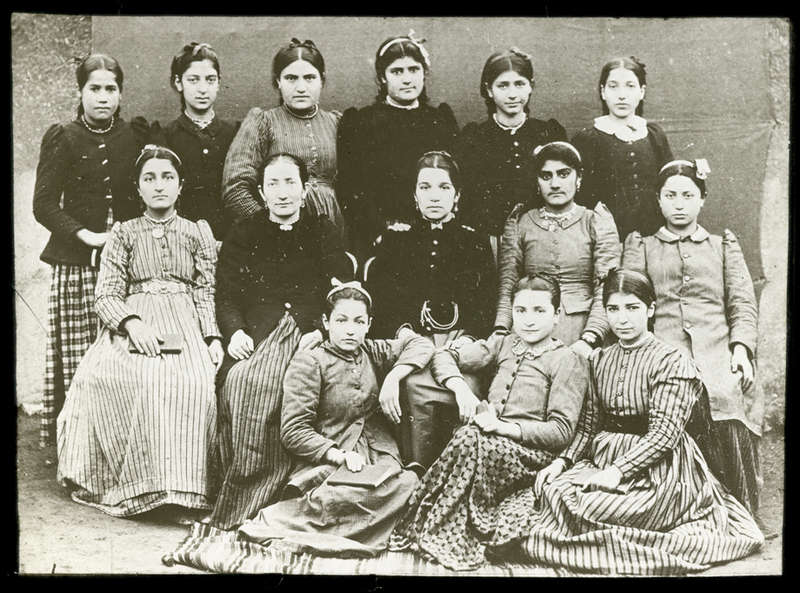 120 Armenian girls were taught at this three story school. It had six grades for children 7-13. The school was located to the north of St. Asdvadzadzin Church. 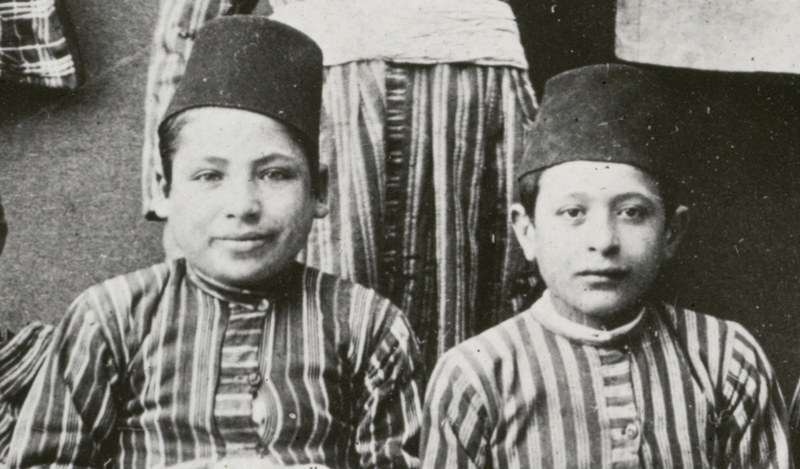 After the 1895 massacres of Armenians, the first two floors were handed over to the orphanage where 40 orphans were cared for and received an education. The orphanage operated from 1898 to 1903. “The houses are built, as all towns, on an uneven surface, in an amphitheater style, in the form of an ascending stairwell. The interior appearance and style of houses resembles one more of Aleppo. All are stone built and the floors are mostly covered with choice polished stone or wood. It is pleasant to see oneself on a second floor after thinking that one has entered the first floor from the door on the street, given that houses in Arapgir generally have such a form, an appearance that is impossible to see in Van, Garin, Yerznga, Dikranagerd and many other field towns. […] The sand like soil particular to Arapgir, like gruel, which sticks together like a stone and is used for the roofs, preventing rain water seepage so particular to homes with dirt roofs, completes the splendor and exterior of Arapgir homes. Market, store, house, factory, garden, field, water brooklets, trees and flowers, the black and white coating of homes or exterior appearance, all these when mixed together present a diverse, aromatic, scene that isn’t difficult to imagine. This is the picture of Arapgir […]"
Arapgir: Celebration Day. The building appearing in the background is probably the konak (government building). Passenger and cargo ferries crossing the Euphrates River. Arapgir: The Djerdjian family drinking coffee, probably in their home’s courtyard. 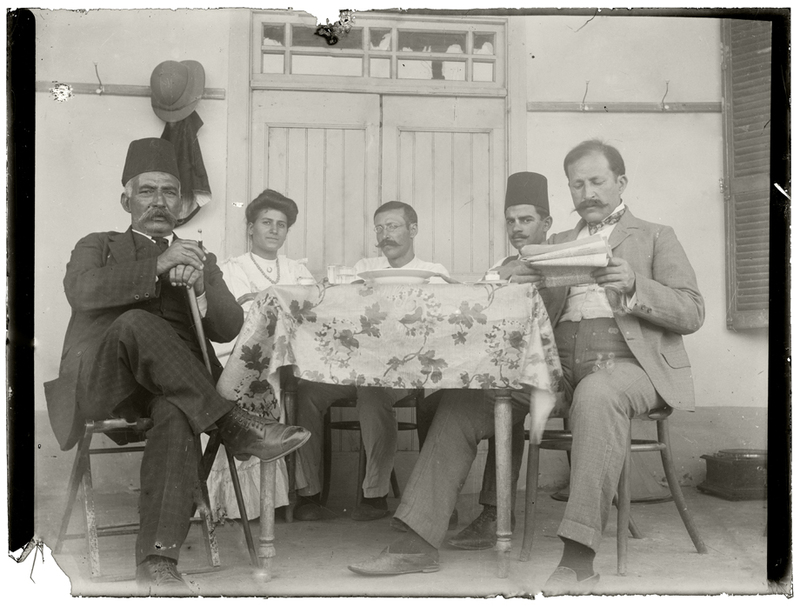 Second from left: George/Kevork Djerdjian. A gramophone appears on the ground in the back right corner with its amplifying horn nearby. Arapgir: Djerdjian Family. 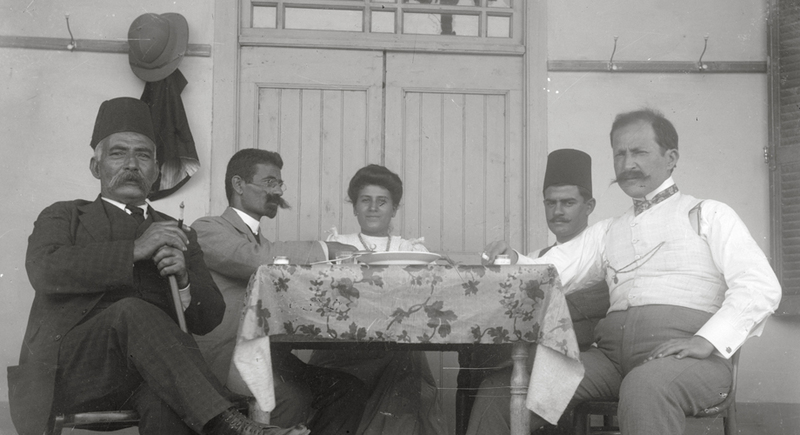 First person on right is reading an Armenian newspaper. These photos were likely taken in the vicinity of Arapgir. 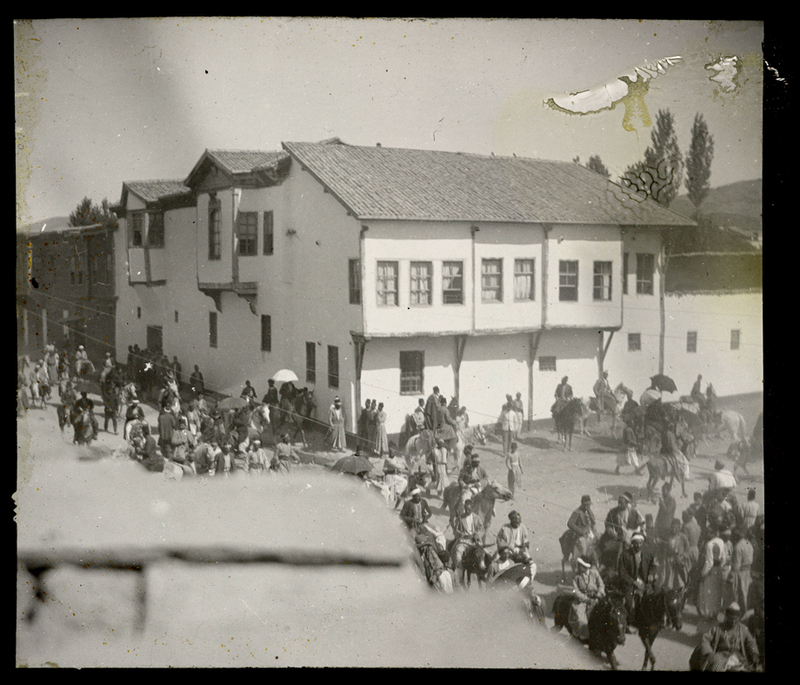 Based on the photos displayed in this Harput/Kharpert section, it turns out that Djerdjian was also in the region of Harput, with his trusty camera at his side, visiting the town itself and neighboring villages. 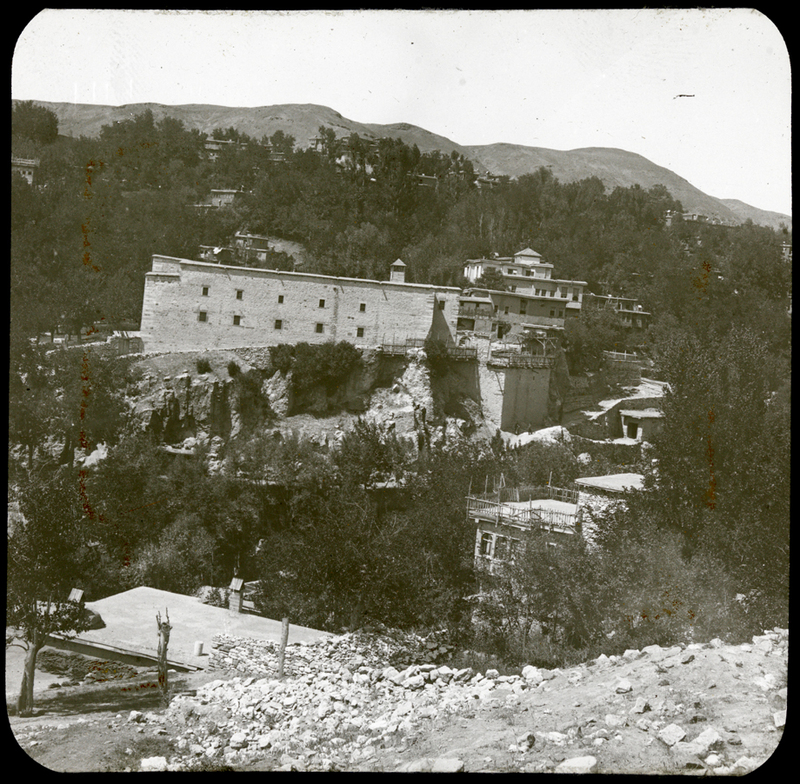 This photo depicts the historic cemetery of Khoulavank. This information was sent to us by Samuel Karapetyan. We thank him for this. 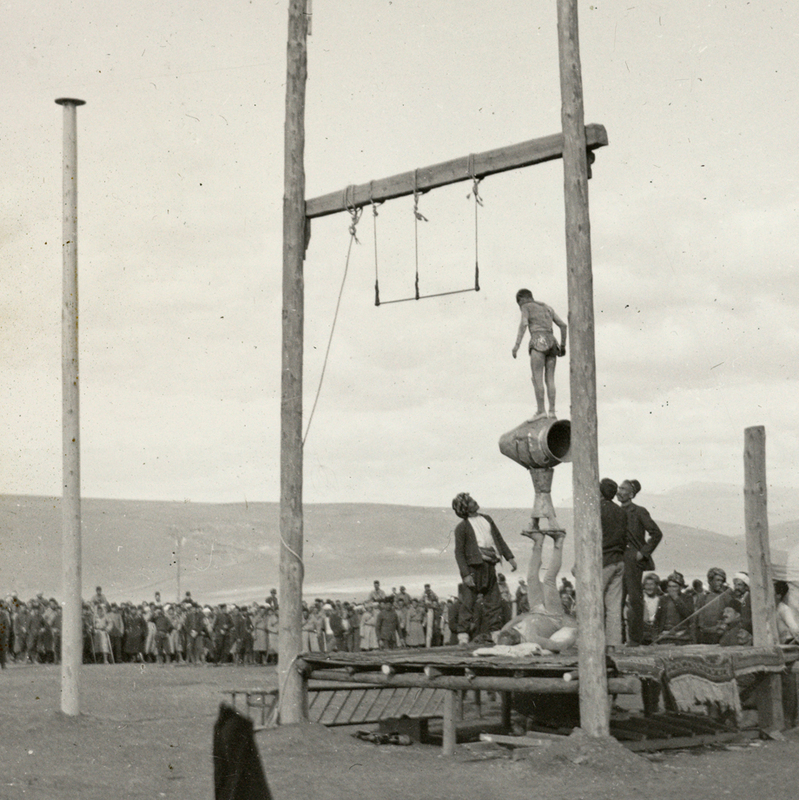 He compared this Djerdjian photo with another familiar photo of Khoulavank. The similarity is striking. The old stone crosses (khachkar) are destroyed and no longer exist. This, of course, imparts a new value to the Djerdjian photo. The locale is a few minutes east of Khoulakyugh village (Hulvenk/Şahinkaya). 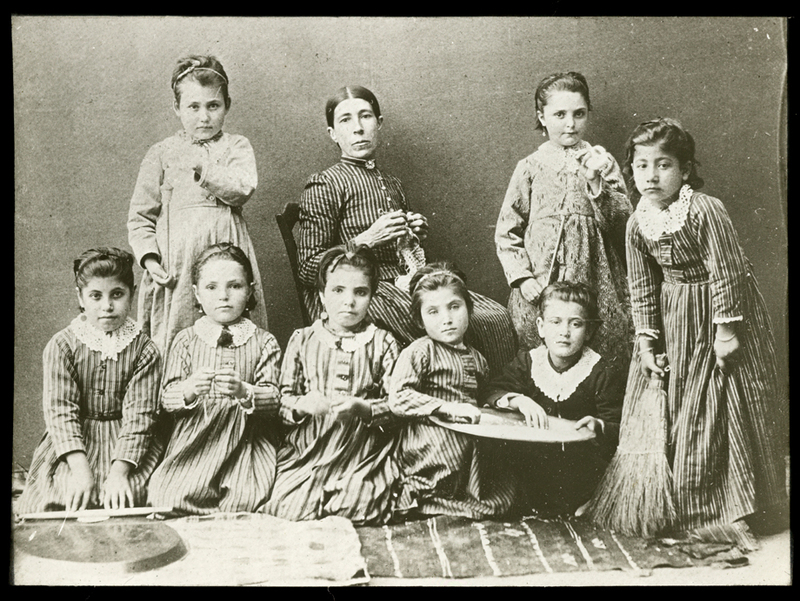 Harput/Kharpert: Armenian girls’ orphanage; pupils and teacher. The photo clearly shows that the orphans are learning lacework. 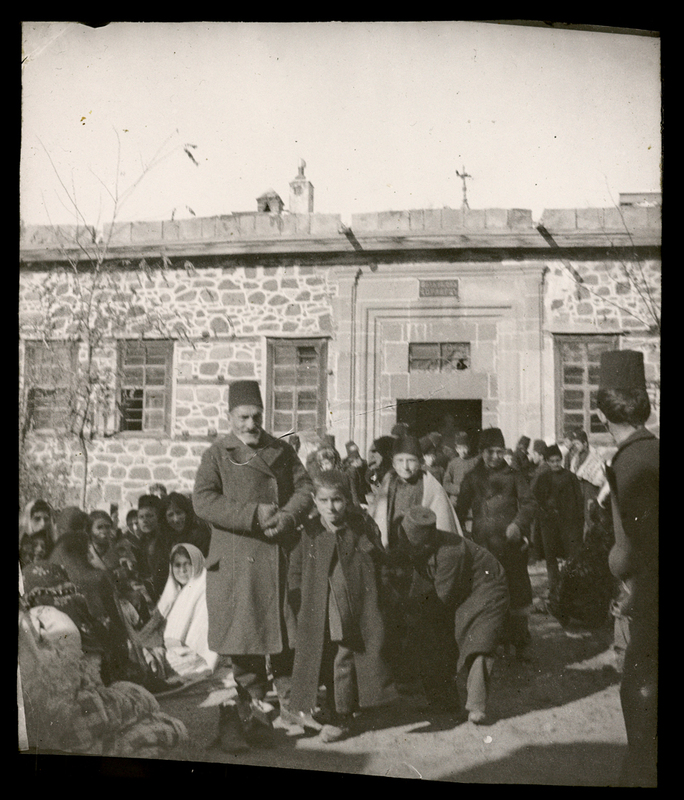 Girls and boys being cared for at the American Orphanage in the town of Harput. 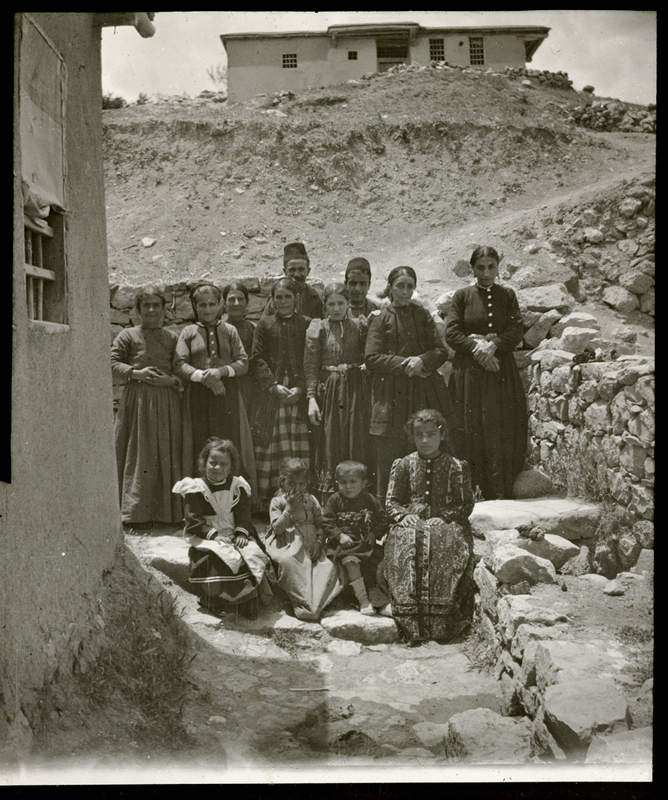 The fact that these photos were taken in Harput is verified by means of the Missionary Herald, an American magazine of the American Board of Commissioners for Foreign Missions. In its December 1897 edition (volume 93, pp. 501-503) the magazine displays these photos. (This information was provided to us by Nazan Maksudyan). The orphanage, located in the Euphrates College complex, was built after the 1895 anti-Armenian massacres during the reign of Sultan Abdülhamit II. 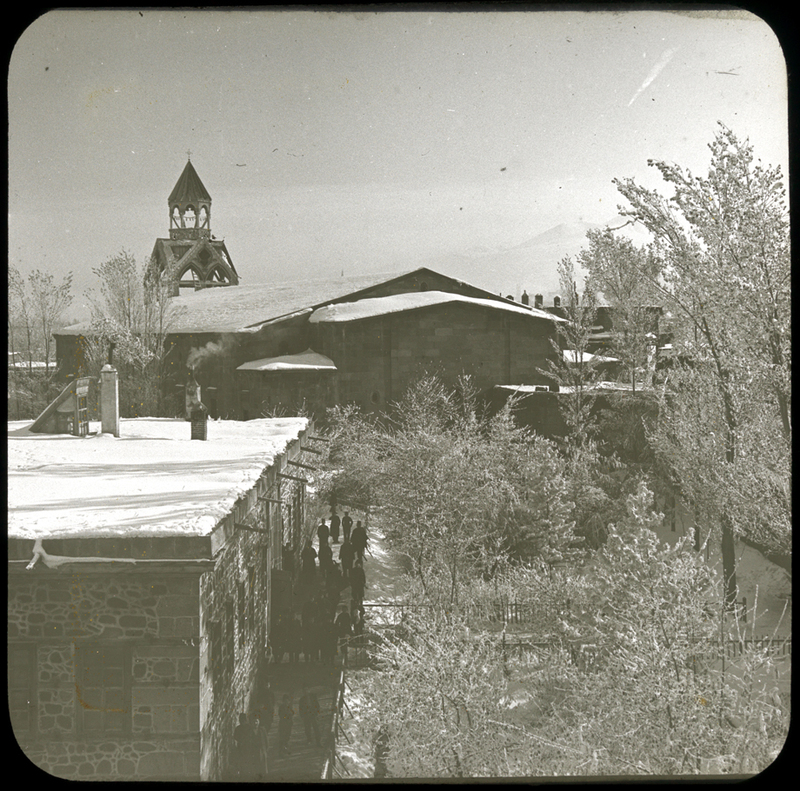 More than one hundred Armenian orphans, boys and girls, were housed here, learning a variety of trades. The first photo shows the tailoring workshop; the second, the shoemaking unit. We know that many boys and girls from Arapgir were also cared for here. The photos were taken in 1897. 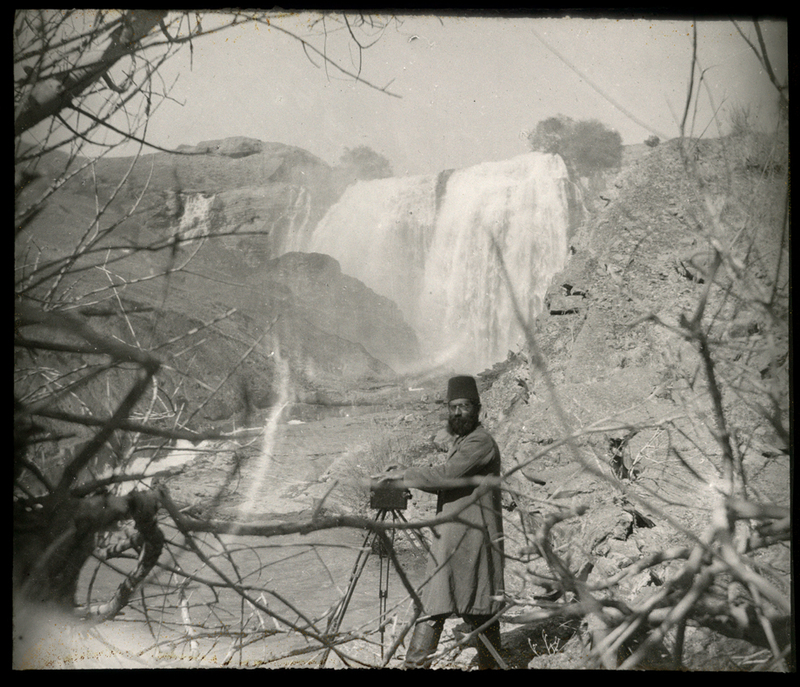 According to our information, Djeredjian brought his camera equipment from Switzerland; when he returned in 1900. 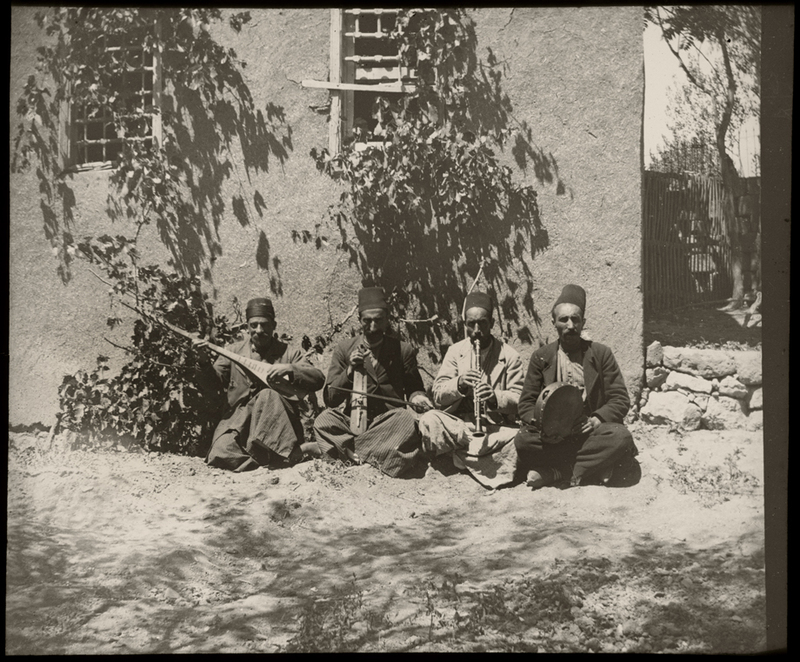 But the Harput photos were taken a few years before this. 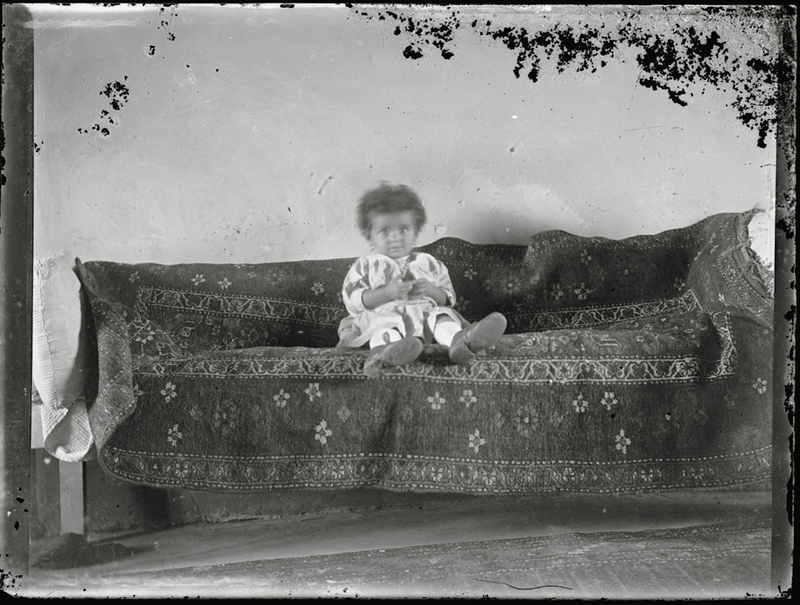 So, did Djerdjian possess a camera prior to 1900? Were these orphanage photos taken by someone other than Djerdjian? These are questions that remain unanswered. The Erzurum/Garin Sanasarian College was built in 1881 with financial assistance from Mgrdich Sanasarian, a merchant who had resettled to St. Petersburg. 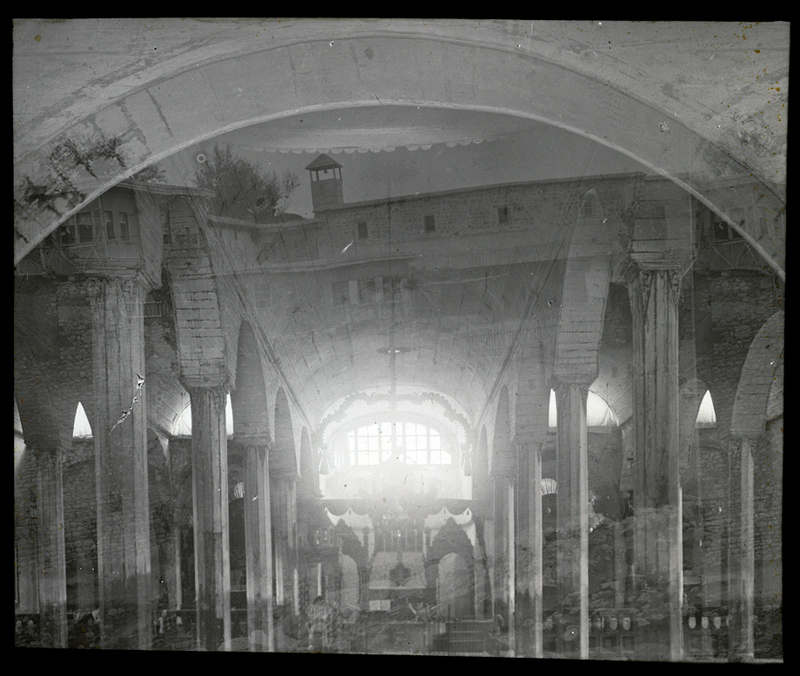 It was the most prominent and high level Armenian cultural centers that operated in the Ottoman Empire. A significant portion of the teachers received their education at European universities, especially in Germany. 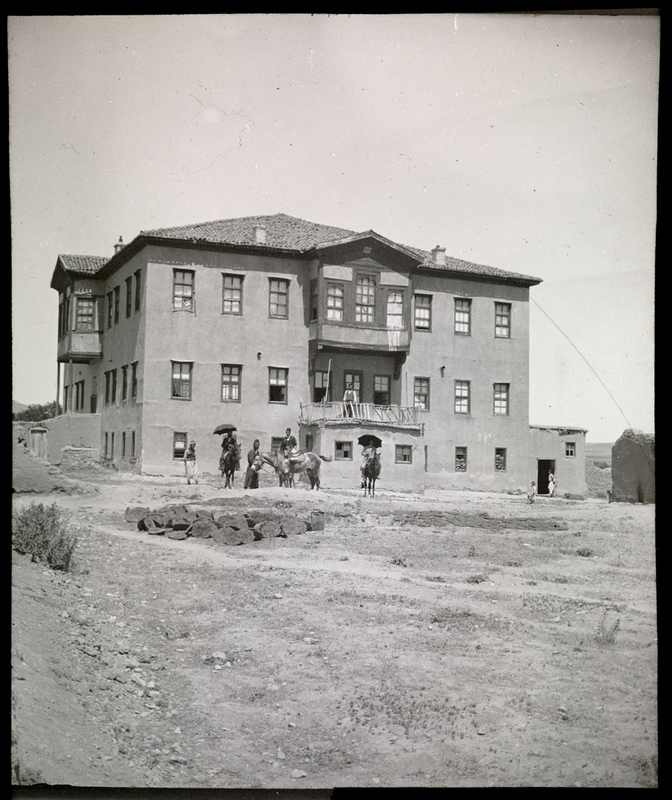 The school was located near the building housing the Erzurum Armenian Diocese. In 1883, 33 pupils from Arapgir were enrolled at the school. George Djerdjian was one of these pupils and later taught at the school. On the left, in front, is one of the Sanasarian College buildings. In the background are the Diocese and the church belfry. 2) Most probably the Sanasarian College band performing on the banks of a lake. 1); 2) Sanasarian College entrance. A celebration attended by high-ranking state guests. 3) Sanasarian College skating rink. 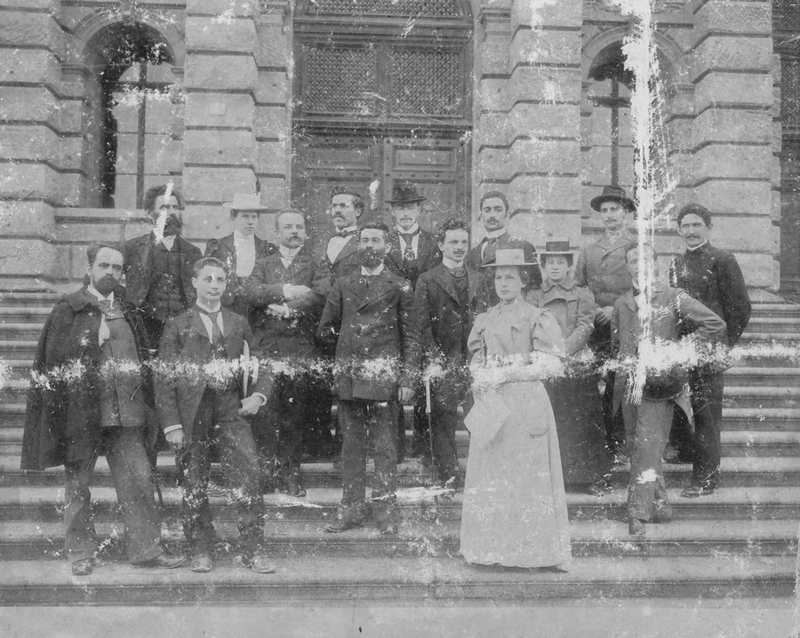 George Djerdjian standing in center. Sanasarian College students probably at a picnic. 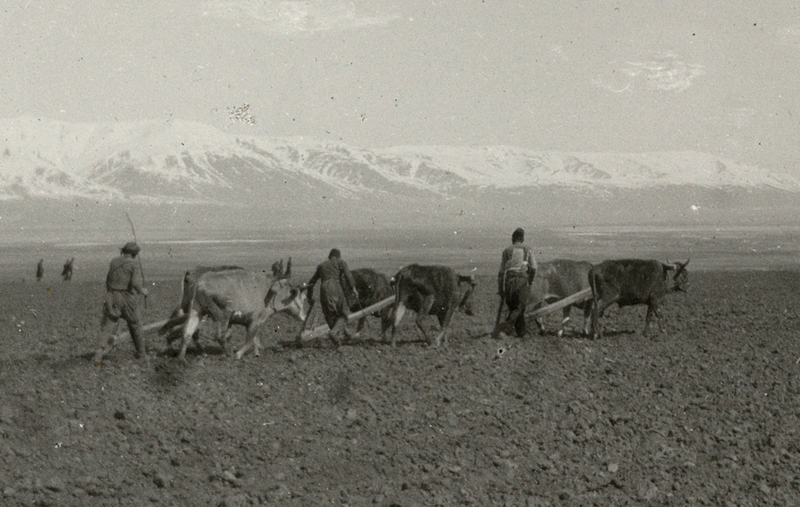 Erzurum – The building in the backdrop is probably the government office (Hükümet Konağı). The imperial insignia appears at the entrance to the building, in the upper portion. This suggests it was a government building. We know that the building burnt down in those years and was moved elsewhere. 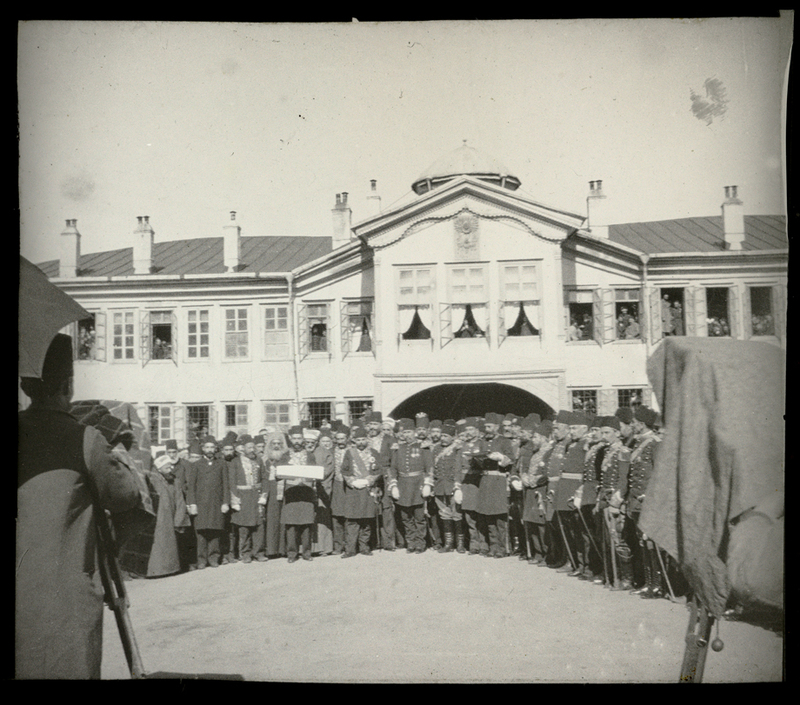 The photo depicts some sort of ceremony attended by Ottoman government officials and high ranking military personnel. We thank Tolga Cora for this information. 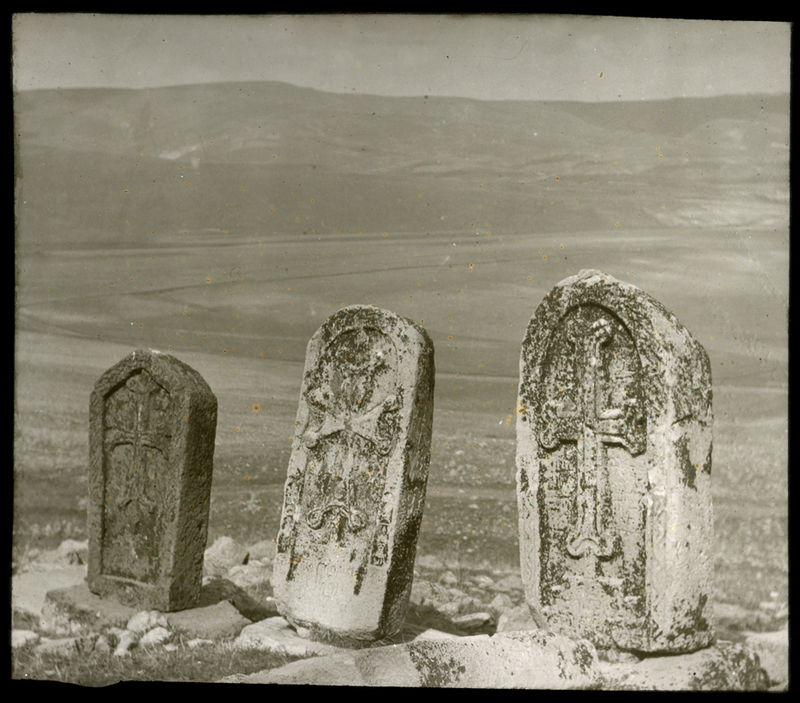 St. Asdvadzadzin Cemetery Stone Crosses (khachkar) – Information provided by Samuel Karapetyan. 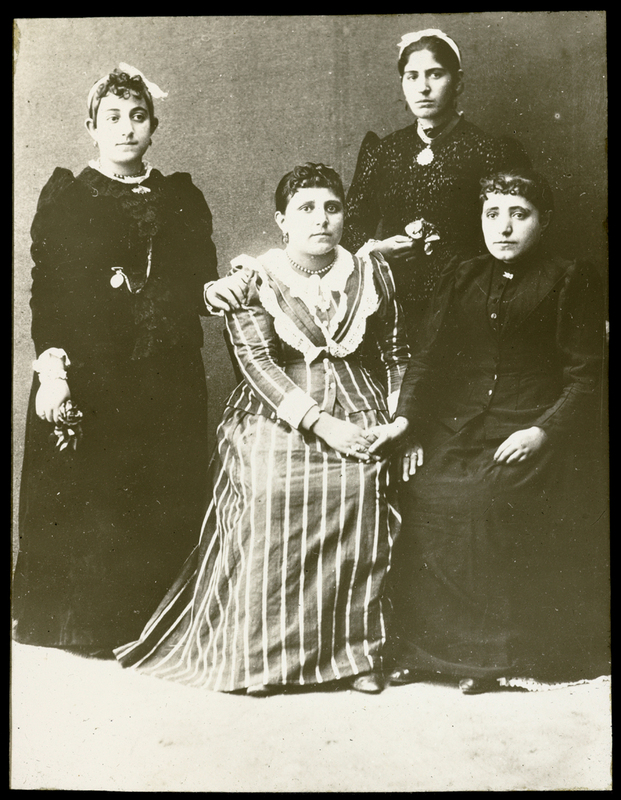 Pupils at a girls’ school. Most likely in Erzurum. Most likely photographed in the environs of Arapgir or Erzurum. It is interesting to see the diversity of dress. 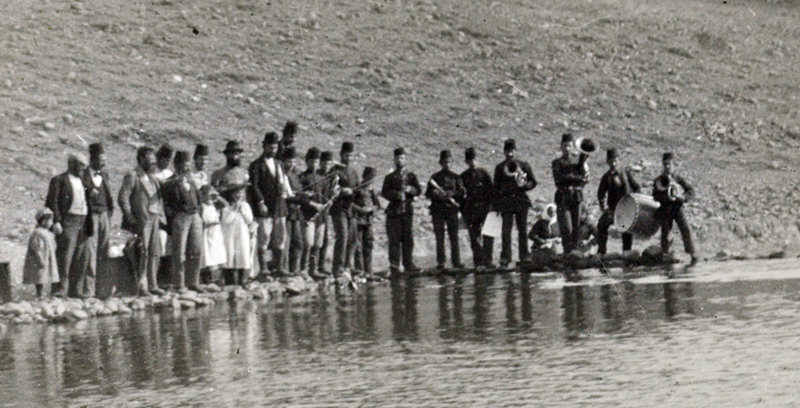 The man standing on the left, wearing a fez, is using a net to catch fish. 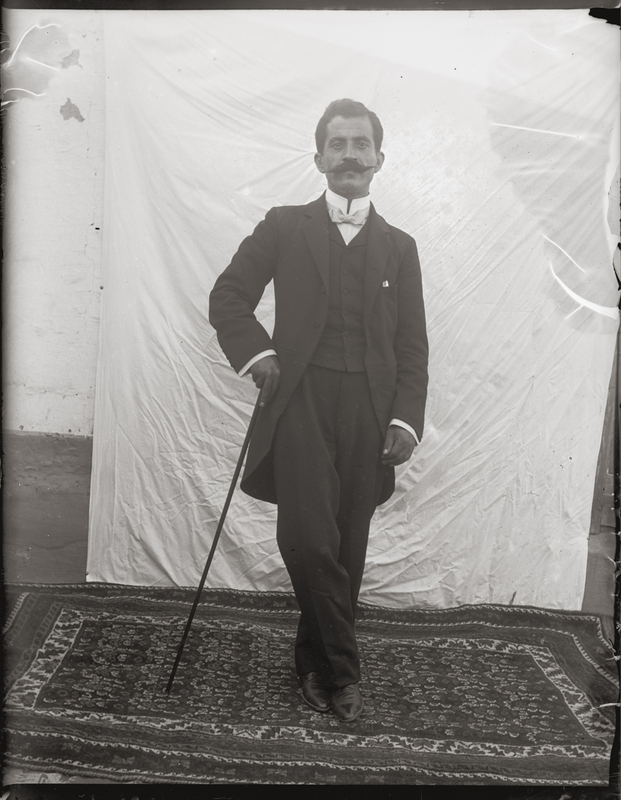 These 100 glass plates or photographs are what remain from an original collection of about 240 glass plates, which my grandfather, Dr. George Djerdjian, took between 1900 and 1907 of his home town of Arapgir/Arabkir and the city of Erzurum/Garin, where he studied at the Sanasarian College. 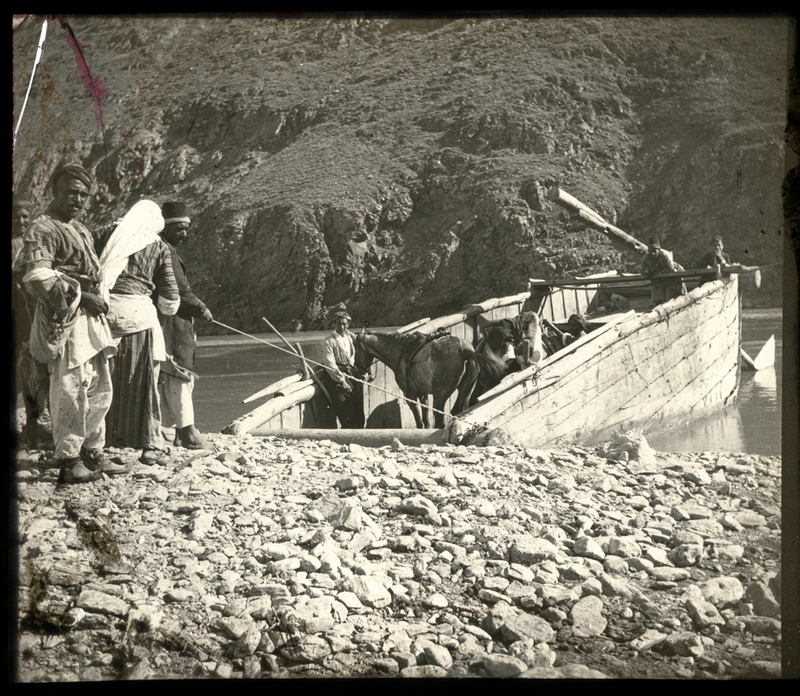 These photographs include landscape scenes of mountains and rivers, peoples of all races, religions, and socio-economic backgrounds in the Ottoman Empire; churches and schools; and numerous scenes of economic, political and social activities. 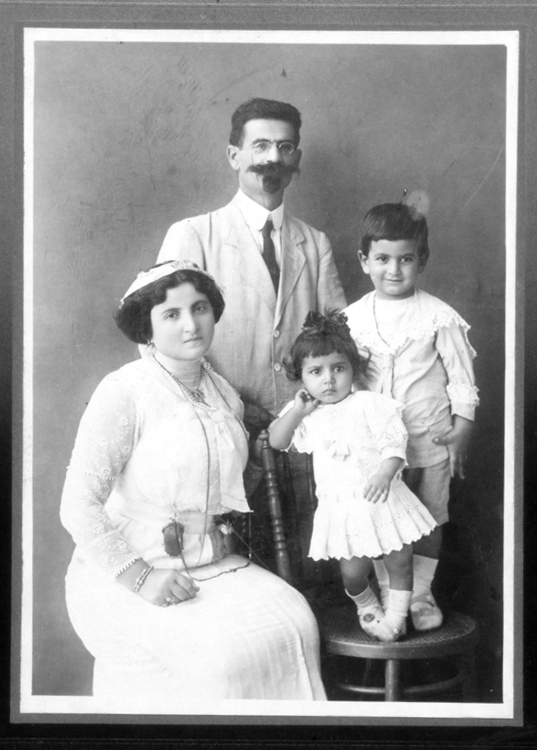 Dr. George Djerdjian was born in Arapgir on March 1870, the fifth of six children of Hovagim (Joachim) and Aghavni (Dove) Djerdjian. 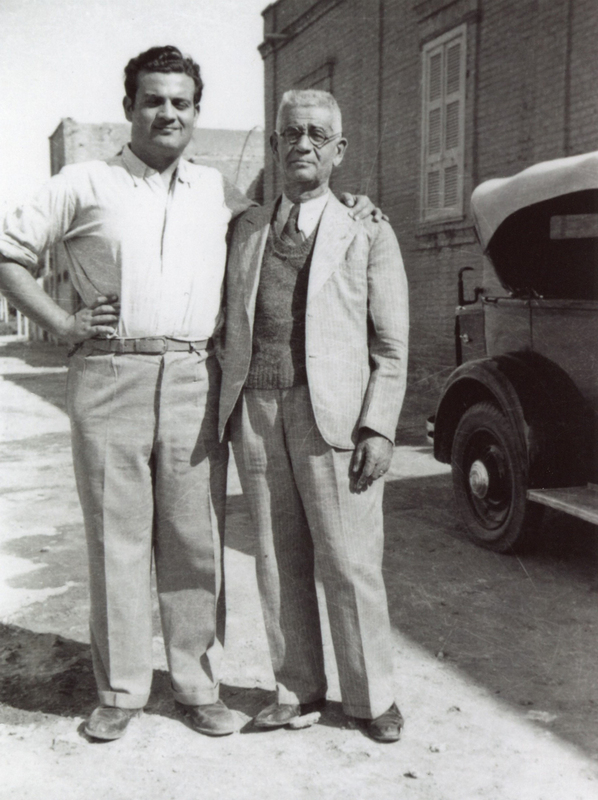 Being a bright student, he was sent to Sanasarian College in Erzurum, where after graduating he taught there until 1895 (aged 25), when he was awarded a scholarship to study for a doctorate in Natural Sciences at Zurich Polytechnic, in Switzerland (today’s ETH Zurich). 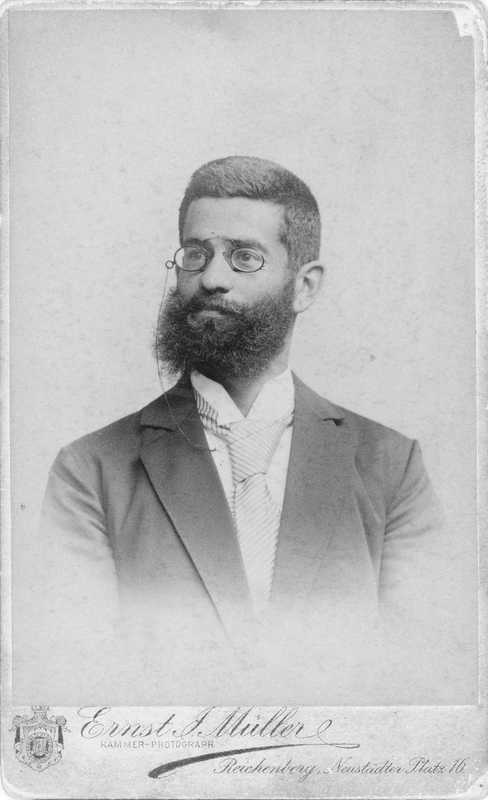 He first went to Reichenberg, Austria (now called Liberec, Czech Republic) to study German for a year and then proceeded to Zurich where he spent three years (1896-1899). In 1900, he returned home with the title of ‘doctor’ and a field camera and began his teaching career at Sanasarian College for the following seven years. 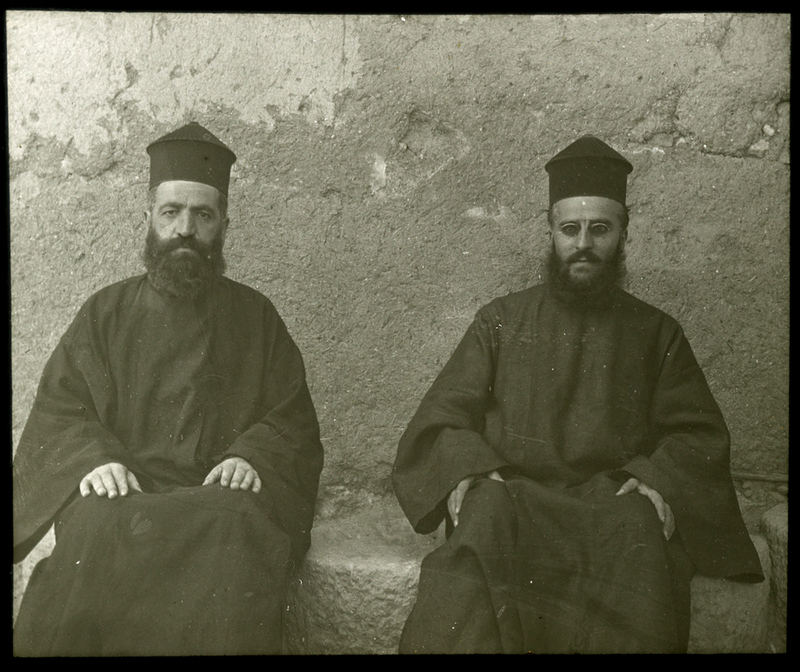 In the summer months, he would return home to Arapgir – a three-week journey in those days - and take photographs. Being a chemist, he developed the negative plates into blue prints and lantern slides. 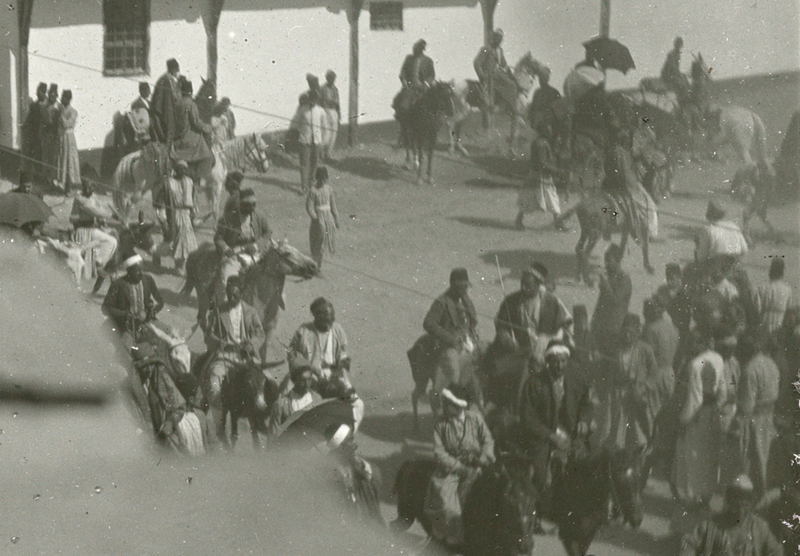 In 1907, he travelled to Alexandria, Egypt, with his photographs, where he was offered a position as manager of the Sudan business of the Kurkjian Brothers, who were also natives of Arapgir. In 1909, he married Bargesht, the elder daughter of Nazaret Kurkjian, in the Presbyterian Church in Omdurman, Sudan. They had three children: Arsen born in 1910, Diana in 1915, and Edward, my father, in 1920. In 1924, he started his own business, Geo. Djerdjian & Sons, and Birmingham Stores and he made enough money to send his children to Victoria College, an English school, in Alexandria, Egypt, after which his sons joined him in his business. Although he was not affiliated to any political party, he wrote frequent articles in Arev, an Armenian language daily, published in Cairo, Egypt, since 1915 by the Armenian Democratic Liberal Party (Ramgavars). He was a member of the board of trustees of the Boghosian School in Alexandria, and also a founding member and first chairman of the Sudan chapter of the Armenian General Benevolent Union (AGBU). In October 1947, he died at the age of 77 in Alexandria and is buried there. 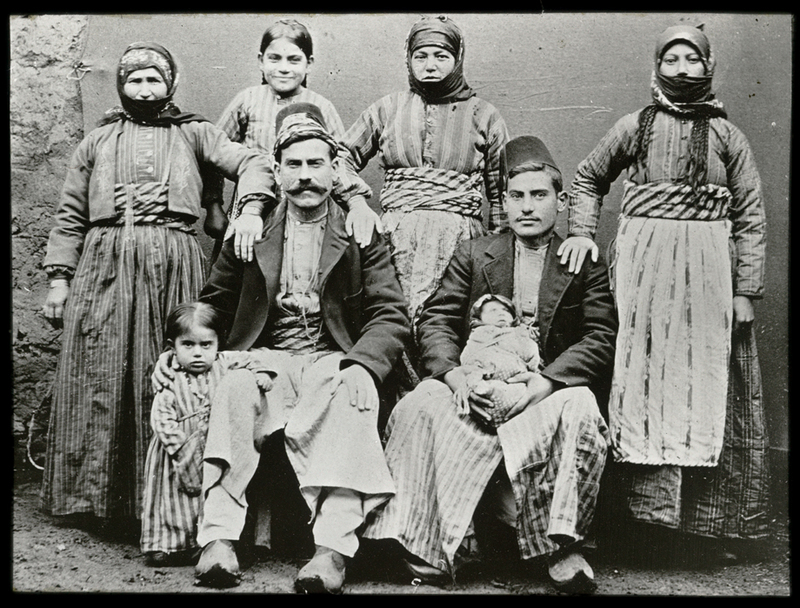 When Dr. Djerdjian left Arapgir in 1907 to travel to Alexandria, Egypt, he took his collection of glass plates and photographs, which is how they survived the cataclysm that befell the Ottoman Armenians in 1915. 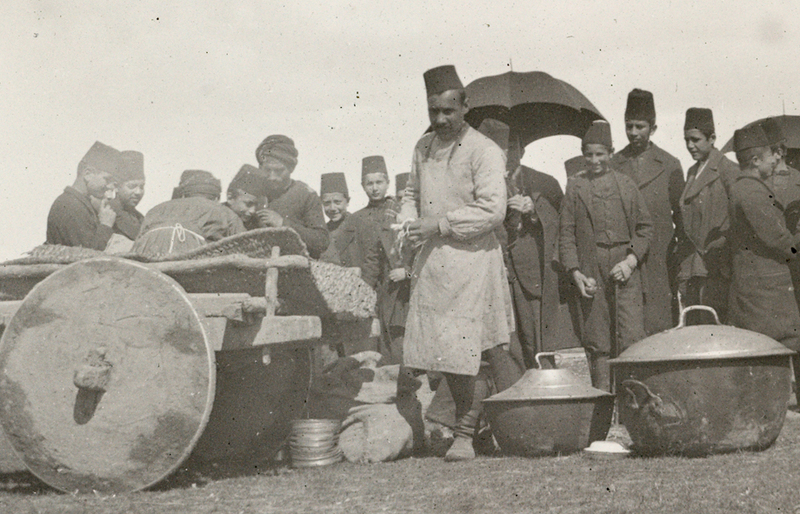 The collection remained in Alexandria from 1907 to 1956, a year short of 50. 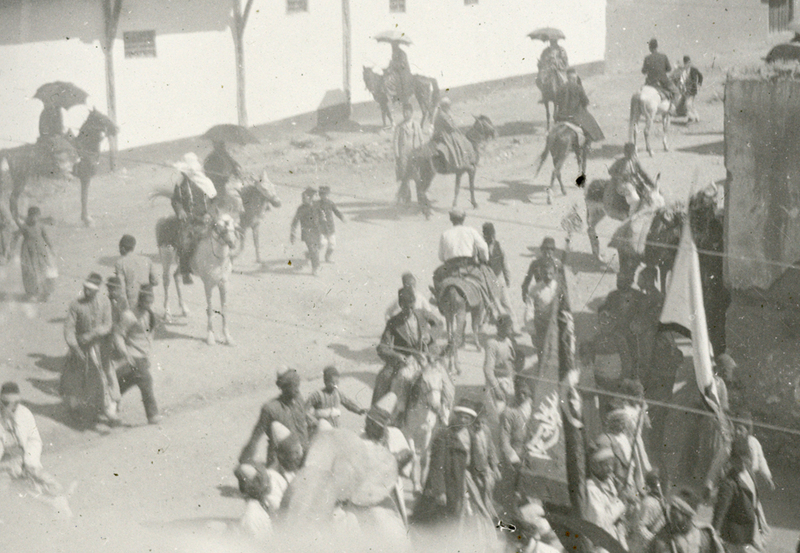 In 1956, when on a visit to Khartoum, to see her son Edward and his family, Bargesht took this collection to hand over to them, as they were the only male descendants carrying her late husband’s family name. 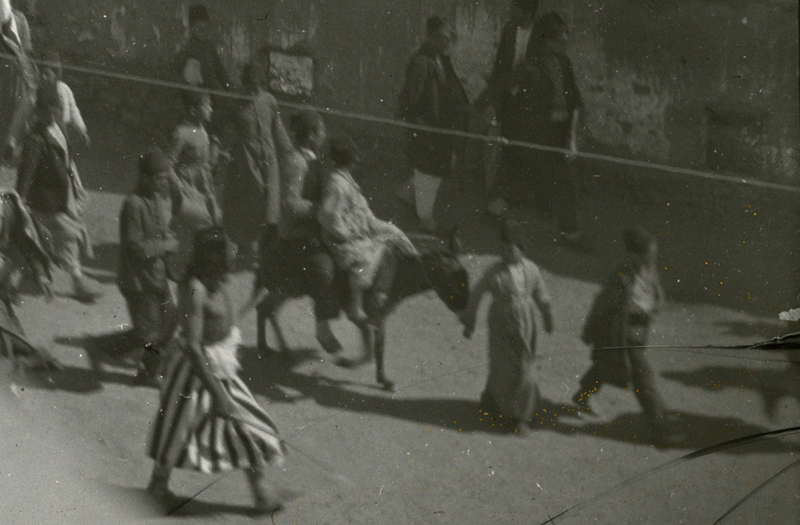 The box of glass plates and photographs remained in Khartoum from 1956 to 1973 – a period of 17 years. In 1973, with political upheaval in the Sudan, my mother moved to London and my father sent family heirlooms and possessions, including his father’s glass plates and photographs in a grey steel Chubb fireproof box. The box remained in the London apartment for the next 30 years, until 2003, when my father died. Following his death, we discovered the grey steel box containing the glass plates. Recognizing the potential of this discovery, I arranged for them to be sent, on loan, to the nascent Armenian Genocide Memorial Museum (AGMM) in Washington DC. With funding from my mother, I also arranged for Antranik Poladian’s book History of the Armenians of Arabkir, to be translated from Armenian into English, after which I proceeded to produce an abridged version which I called: Arabkir: Homage to an Armenian Community. Both the glass plates and the book languished for almost a decade because the AGMM was locked in an internecine litigation and ultimately the project floundered. 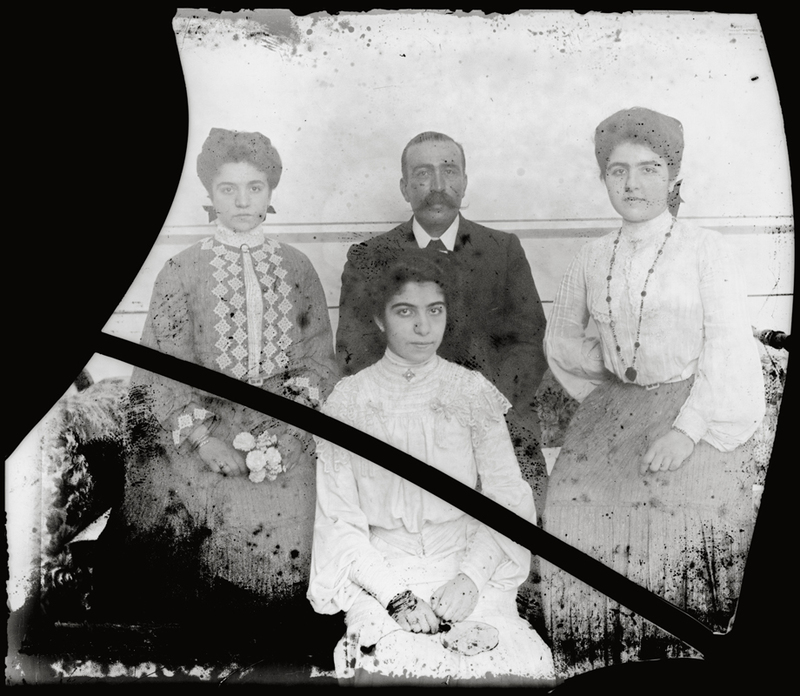 Finally, in early 2014, with the centennial of the Armenian Genocide upon us, I took it upon myself to have the glass plates developed and printed by a specialist firm, the Chicago Albumen Works in Massachusetts. Thereafter, I arranged to have two books published by Xlibris, a Penguin Company, in Indiana. The first was Arabkir: Homage to an Armenian Community (2014) and the second, Daylight After a Century, (2015) which was a compilation of the 100 photographs of my grandfather. 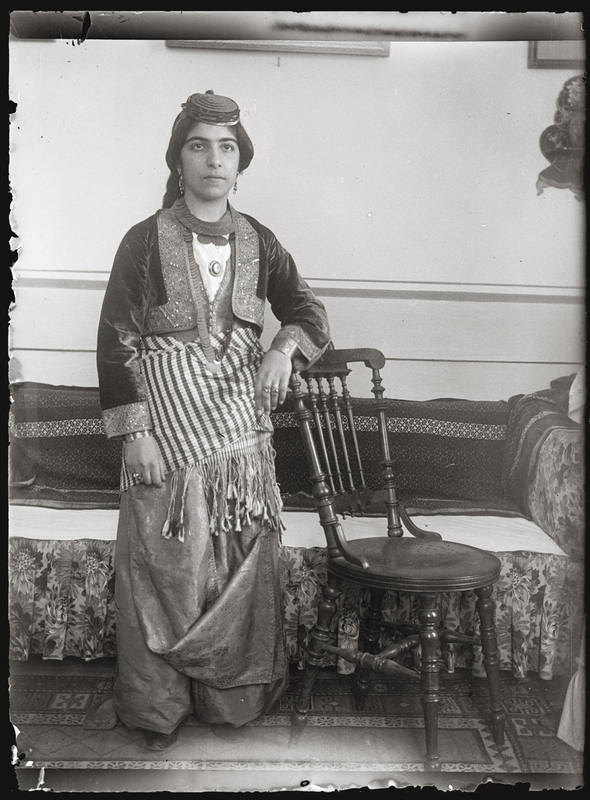 This small piece of history – these century-old glass plates are a testament to Ottoman life lost in the mists of time. 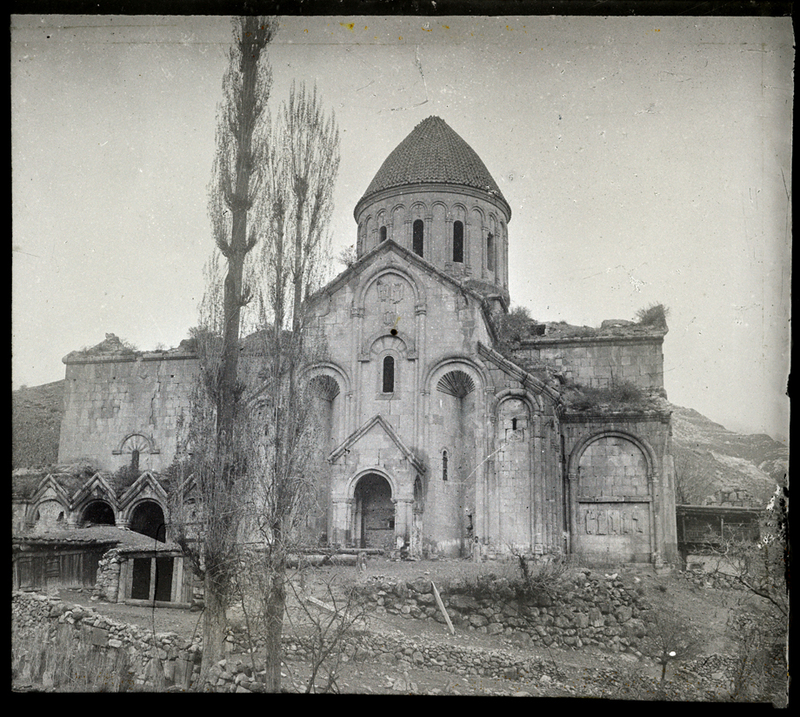 It is remarkable that these glass plates survived the cataclysm and calamity of the First World War, that buried four Empires – Austro-Hungarian, Russian, German, and Ottoman – and which decimated the Armenian nation. More impressively, it is nothing short of a miracle that these glass plates survived the past 100 years in exile, with my family, moving from home to home, from generation to generation, from country to country, crossing continents and oceans and finally to drop anchor and find its resting place at the Armenian Genocide Museum in Yerevan, with copies in New York, Boston, Washington DC, London and Berlin.